I finally caved and picked up a new full-sized iPad this week, so it stands to reason that this Week in Gaming Apps be bigger and higher resolution than the last, with a plug that doesn't fit any other the ones that came before it. I've only had the iPad 4 since Monday, and I've already filled two pages with games, thanks to a robust crop of new iOS releases this week. We finally got Real Racing 3, which I wasn't quite as pleased with as I had hoped I'd be. We also got a new Alien Vs. Predator title, which put the recent console release to shame, not that it was a particularly difficult feat. But wait, there's more! 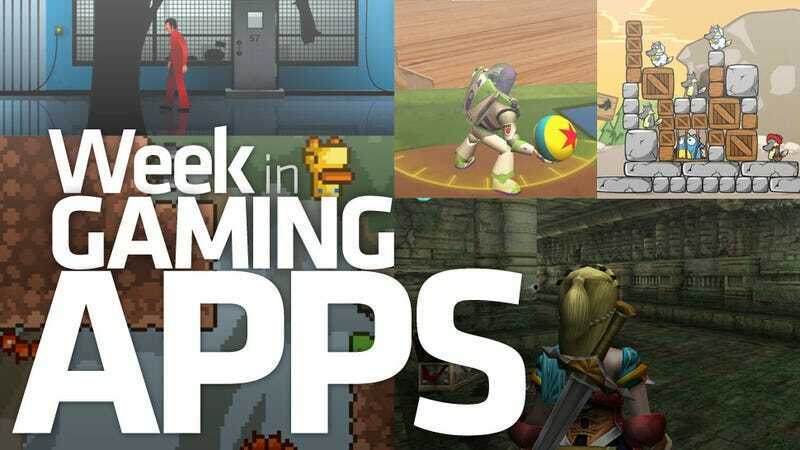 There's a new Toy Story game, a little Hello Kitty (if you're nasty), and an excellent opportunity for me to include a picture of my cat in the Week in Gaming Apps. I'm calling it a success. Here's what we've played this week! A cool little take on pipe-type puzzles, directing power to processors in nano tubes. Arcade strategy at its smallest and finest. How have I missed this game? A full-on 3D dungeon-crawler type RPG from the folks at XSeed. Swipe-based combat is a blast! A pixelated puzzle platformer featuring a duck with the ability to manipulate his gravimetric field. Challenging and fun! It's like Angry Birds in 3D with Toy Story characters. This is a good thing. More Angry Birds-ish destruction, only this time there's fire involved. Everybody loves fire. An incredibly pretty little physics puzzle game involving a brass slingshot and 126 levels of ball-bouncing goodness. Another card-collecting battle game, but this one has some great animations instead of just making you watch numbers appear on the screen. The first episode of what promises to be an amazing time-twisting point-and-click style adventure saga. I just picked up this one to take pictures of my cat. An online pool game in which one player wins because the other leaves when they realize this is an online pool game. You control a man in very fetching leotards. You've got to make him backflip. And that's it! Sound easy? Hahahah. Hahah. Hah. No.